This system uses the key buttons to remotely lock and unlock the doors and the liftgate. System malfunctions or operations are indicated by the following warnings. • KEY Warning Light (Red)/KEY Indicator (Green) Refer to Warning/Indicator Lights on . •Ignition Not Switched Off (STOP) Warning Beep Refer to Ignition Not Switched Off (STOP) Warning Beep 3. •Key Removed from Vehicle Warning Beep Refer to Key Removed from Vehicle Warning Beep 3. If you have a problem with the key (transmitter), consult an Authorized Mazda Dealer. If your key (transmitter) is lost or stolen, consult an Authorized Mazda Dealer as soon as possible for a replacement and to make the lost or stolen key (transmitter) inoperative. Radio equipment like this is governed by laws. • The keyless entry system operation may vary due to local conditions. • The keyless entry system is fully operational (door/liftgate lock/unlock) when the push button start is switched off. The system does not operate if the push button start is switched to any position other than off. • If the key (transmitter) does not operate when pressing a button or the operational range becomes too small, the battery may be dead. To install a new battery, refer to Replace Electrical Battery. 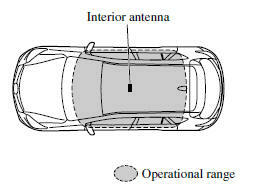 • Additional key (transmitter) can be obtained at an Authorized Mazda Dealer. Up to 6 keys can be used with the keyless functions per vehicle. Bring all key (transmitter) to an Authorized Mazda Dealer when additional key (transmitter) are required. A beep sound can be heard for confirmation when the doors and liftgate are locked/ unlocked using the key. If you prefer, the beep sound can be turned off. 1 Switch the ignition off and close all of the doors and the liftgate. 2 Open the driver's door. 3. Within 30 seconds of opening the driver's door, press and hold the LOCK button on the key for 5 seconds or longer. 4. The setting change is completed by doing any one of the following: • Switch the ignition to ACC or ON. • Close the driver's door. • The key is not operated for 10 seconds. • The key UNLOCK button is pressed. • A request switch or the electric liftgate opener is pressed. To lock the doors and the liftgate, press the lock button and the hazard warning lights will flash once. To confirm that all doors and the liftgate have been locked, press the lock button again within 5 seconds. If they are closed and locked, the horn will sound. • The doors and the liftgate can be locked by pressing the lock button while any other door or the liftgate is open. The hazard warning lights will not flash. When the lock button is pressed while any door is open and then the door is closed, all the doors and the liftgate are locked. • Confirm that all doors and the liftgate are locked visually or audibly by use of the double click. • When any door is opened from the outside while the key is inside the vehicle, the closed doors are locked. 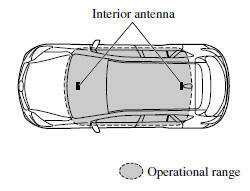 All the doors are automatically unlocked by closing the open door and the beep sound is heard for about 10 seconds to notify the driver that the key has been left in the vehicle. • Make sure all doors and the liftgate are locked after pressing the button. • (With theft-deterrent system) When the doors are locked by pressing the lock button on the key while the theftdeterrent system is armed, the hazard warning lights will flash once to indicate that the system is armed. To unlock all doors and the liftgate, press the unlock button again within 3 seconds and two more beep sounds will be heard. • The system can be set to unlock all doors by performing a single operation. 3 Within 30 seconds of opening the driver's door, press and hold the UNLOCK button on the key for 5 seconds or longer. When you hear the lock/unlock operation sound for the doors, the system switches to the new setting. After this, if you want to continue changing the setting, the system switches through the sequence of available settings and sounds the lock/unlock operation sound each time you press the UNLOCK button on the key. 4 The setting change is completed by doing any one of the following: • Switch the ignition to ACC or ON. • The key LOCK button is pressed. After unlocking with the key, all doors and the liftgate will automatically lock if any of the following operations are not performed within about 60 seconds. If your vehicle has a theft-deterrent system, the hazard warning lights will flash for confirmation. • A door or the liftgate is opened. • The push button start is switched to any position other than off. When the doors are unlocked by pressing the unlock button on the key while the theftdeterrent system is turned off, the hazard warning lights will flash twice to indicate that the system is turned off. If you witness from a distance someone attempting to break into or damage your vehicle, pressing the panic button will activate the vehicle's alarm. The panic button will work whether any door or the liftgate is open or closed. Pressing the panic button for 1 second or more will trigger the alarm for about 2 minutes and 30 seconds, and the following will occur: • The horn sounds intermittently. • The hazard warning lights flash. The alarm stops by pressing any button on the key. • Starting the engine may be possible even if the key is outside of the vehicle and extremely close to a door and window, however, always start the engine from the driver's seat. • The luggage compartment is out of the assured operational range, however, if the key (transmitter) is operable the engine will start. • Starting the engine using the push button start. •(With the advanced keyless function) Operating the request switches. • Press a button on the key which has had its functions temporarily suspended. •For vehicles with a type A meter, messages are displayed in the instrument cluster. When carrying another key, depress the clutch pedal until the KEY indicator light (green) illuminates. When carrying another key, depress the brake pedal until the KEY indicator light (green) illuminates.